Is Chris Brown's new tattoo supposed to be a battered Rihanna? Singer Chris Brown has so many tattoos that there's a website devoted to chronicling them. But his latest ink is drawing controversy. 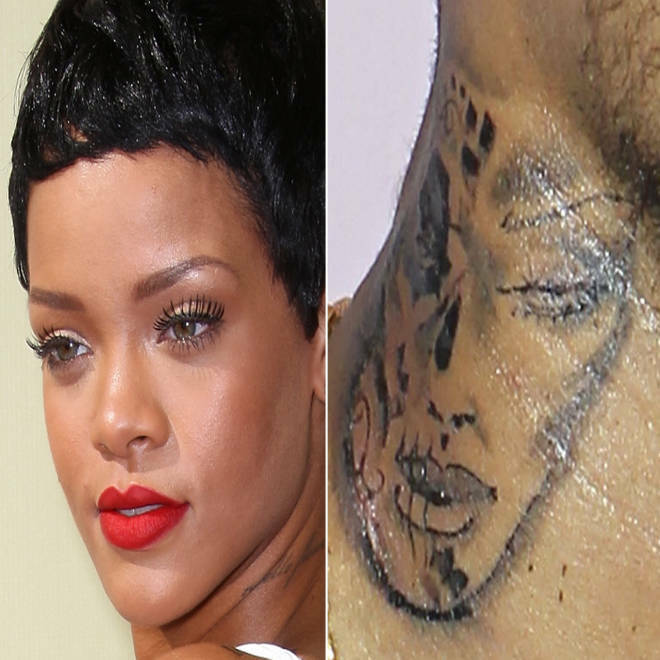 Singer Chris Broiwn has a new tattoo that many think resembles his former girlfriend, Rihanna, seen at left in 2012. The image, on the singer's neck, looks to some like Brown's former girlfriend Rihanna, who was assaulted by Brown in 2009. Brown's neck tattoo is of a woman's face that is marked in ways that could represent injuries -- three slashes through her lips, what appears to be a black eye, other marks that could be bruises. But the markings are decorative enough that it's unclear whether the face is meant to represent an actual abused woman. After she was assaulted by Brown, a photo taken of Rihanna's injured face was circulated online, and many are making comparisons between that image and the tattoo. TMZ.com cites "sources close to Brown" who tell the website the image is not meant to be Rihanna, but is instead "a random women." But not everyone believes that. And some think the design was a bad idea regardless of whether it's Rihanna or not. Writes one Gawker reader, "I'm just saying, even if this is a complete coincidence, did NO ONE bring this up to him beforehand?" A reader at TMZ hopes that the tattoo is not yet completed, writing "I know next to nothing about tattoos, and I may be stating the obvious to people who do know, but it doesn't look like it is finished. I think that is just the outline and they will put detail in later. ... Who knows if it will look like her when it is done. But it does kinda look like her now. Bad move." One of Brown's numerous other tattoos is the face of his current girlfriend, Karreuche Tran, on his arm.